Clockwise from top: Samuel Beckett Bridge, Trinity College, Custom House, Dublin Castle, O'Connell Bridge, and Convention Centre Dublin. "The citizens' obedience is the city's happiness"
Dublin is both the largest city and capital of the Republic of Ireland. Founded as a Viking settlement, Dublin has been Ireland's primary city for most of the island's history since medieval times. Located in the province of Leinster in the east-central part of the country at the head of Dublin Bay on the Irish Sea, it is also the nation's chief port and center of financial, commercial, and administrative power. 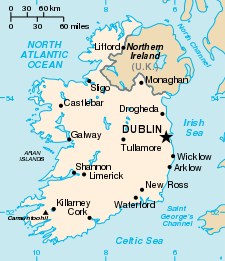 One fourth of the Republic's population resides in the Greater Dublin urban area, and it continues to have one of the fastest growing populations of any European capital city. Long the seat of culture within Ireland, it has been at the center of the country's rich Anglo-Irish literary, philosophical, and political history. Literary figures of international significance who hailed from Dublin include three winners of the Nobel Prize for Literature—William Butler Yeats, George Bernard Shaw and Samuel Beckett—as well as Oscar Wilde, Jonathan Swift, Brendan Behan, and Dracula creator Bram Stoker. James Joyce composed some of his greatest works while in the city. Both Orson Welles and James Mason began their acting careers there. While its history has been one of war and conquest, it has re-emerged since the 1990s as an economic miracle. With Ireland, it rates high in political, economic, and press freedoms, and benefits from its nation's relatively high per capita GDP. 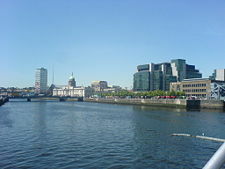 The River Liffey divides the city into Northside and Southside. The name Dublin derives from 'Dubh Linn', with dubh meaning black, and linn meaning pool. The Dubh Linn was a lake used by the Vikings to moor their ships and was connected to the Liffey River by the Poddle River. The Dubh Linn and Poddle were covered during the early 1800s. The common name for the city in modern Irish is 'Baile Átha Cliath' ('The Settlement of the Ford of the Reed Hurdles'). 'Áth Cliath' is a place-name referring to a fording point of the Liffey in the vicinity of Heuston Station. Located near the midpoint of Ireland's east coast, on a hill-ringed plain on a bay, Dublin straddles the River Liffey, into which dark bog water drains, creating the “black pool,” which is the city's name. Dublin enjoys a maritime temperate climate characterized by mild winters, cool summers, and a lack of temperature extremes. The average maximum January temperature is 46°F (8°C), the average maximum July temperature is 68°F (20°C). The sunniest months are May and June. Severe winds are most likely during mid-winter. The wettest months are December and August, with 2.9 inches (74mm) of rain. The driest month is April, with 1.77 inches (45mm). The total average annual rainfall is 30 inches (762mm). The city covers a land area of 44 square miles (114.99 square kilometers). A north-south division has existed in Dublin for some time, with the dividing line being the River Liffey. The Northside is seen by some as working-class (with the exception of a few suburbs such as Howth, Malahide, Portmarnock, Clontarf and Sutton) while the Southside is seen as middle and upper middle class (with the exception of a few "working-class" suburbs such as Ballinteer, Sallynoggin, Crumlin, Drimnagh, Inchicore, Ballyfermot, Palmerstown, Neilstown and Tallaght). 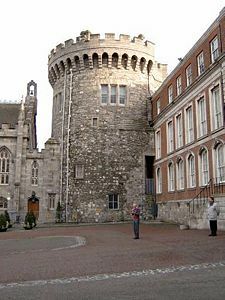 One of the surviving mediæval towers at Dublin Castle. To its left is the Chapel Royal. Dublin Castle, seat of the Lord Lieutenant of Ireland and his court until 1922. 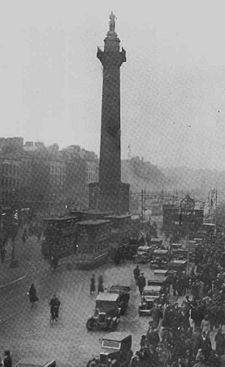 The former Nelson's Pillar on O'Connell Street which was destroyed by the IRA. Most of Ireland was covered with ice until about 9,000 years ago. Mesolithic middle stone age inhabitants arrived some time after 8000 B.C.E., and people have dwelt in the area around Dublin Bay since then. The Greek astronomer and cartographer Ptolemy, around 140 C.E., referred to a settlement he called Eblana Civitas. The settlement 'Dubh Linn' dates perhaps as far back as the first century B.C.E. and later a monastery was built there. Around 290 C.E., “the people of Dublin” were recorded as having defeated an army from Leinster, the province surrounding Dublin. The Vikings, who were Scandinavian explorers, warriors, merchants, and pirates, invaded in the ninth century, and built a settlement on the River Poddle, a tributary of the Liffey, to the East of Christchurch in about 841. The Vikings, or Ostmen as they called themselves, ruled Dublin for nearly three centuries, established a large slave market, were expelled in 902, and returned in 917, notwithstanding their defeat by the Irish High King Brian Boru at the battle of Clontarf in 1014. In 1167, the Norse inhabitants of Dublin supported Roderic O’Connor of Connaught, for the high kingship of Ireland, against their overlord, Leinster king Dermot MacMurrough. Dermot retook Dublin in 1170, helped by an army of Anglo-Normans from Wales. This prompted English king Henry II (1133-1189) to bring an army to affirm his sovereignty, in the Norman conquest of the southern half of Ireland in 1169-1171. After 1171, many Norse inhabitants left the old city, on the south side of the river Liffey, and built their own settlement on the north side, known as Ostmantown or "Oxmantown." Dublin became the capital of the English Lordship of Ireland from 1171, and was peopled with settlers from England and Wales, as was the rural area around the city. In the fourteenth century, this area was fortified against the increasingly assertive Native Irish – becoming known as the Pale. English rule centered on Dublin Castle. The city was also the seat of the Parliament of Ireland, which was composed of representatives of the English community in Ireland. Throughout the Middle Ages, Dublin paid protection money or "black rent" to the neighboring Irish clans to avoid their predatory raids. In 1314, an invading Scottish army burned the city’s suburbs. In 1348, the city was hit by the Black Death – a lethal bubonic plague that ravaged Europe in the mid-14th century. The plague recurred regularly until its last outbreak in 1649. In 1487, during the English Wars of the Roses, the Fitzgeralds occupied the city with the aid of troops from Burgundy and proclaimed the Yorkist Lambert Simnel to be King of England. In 1536, the same dynasty, led by Silken Thomas, who was angry at the imprisonment of Garret Fitzgerald, Earl of Kildare, besieged Dublin Castle. Henry VIII sent a large army to destroy the Fitzgeralds and replace them with English administrators. Henry VIII, in 1532, broke English Catholicism from Rome. The Irish remained Catholic, and were excluded from political power. From 1536, Henry VIII re-conquered Ireland, and in 1541, was himself proclaimed King of Ireland. Opposition by Dubliners to extra taxes to support an English garrison resulted in the settlement there of Protestants from England. These "New English" became the basis of the English administration in Ireland until the 19th century. Thousands of Protestants fled to Dublin to escape the Irish Rebellion of 1641. When Irish Catholic forces threatened the city, the English garrison expelled Catholic Dubliners. The city was besieged twice during the Irish Confederate Wars, in 1646 and in 1649. In 1649, a mixed force of Irish Confederates and English Royalists were routed by Dublin's English Parliamentarian garrison in the battle of Rathmines, and fought on the city's southern outskirts. After the Cromwellian conquest of Ireland (1649-1653), Catholics were banned from dwelling within the city limits under the Cromwellian settlement but this law was not strictly enforced. By 1700, the English imposed the harsh Penal Laws on the Catholic majority of Ireland's population. In Dublin however the Protestant Ascendancy was thriving, and the city expanded rapidly. Under the Restoration, Ormonde, the then Lord Deputy of Ireland, ordered that the houses along the river Liffey had to face the river and have high quality frontages—in contrast to earlier, when Dublin faced away from the river, often using it as a rubbish dump. The population had surpassed 60,000, making it the second largest city after London, in the British Empire, and the fifth largest European city. The city expanded rapidly. Helped by the Wide Streets Commission, much of Dublin's most notable architecture dates from this time and is considered a golden era for the city. The famous Guinness brewery was established then. In 1742, Handel's Messiah was performed for the first time in New Musick Hall in Fishamble Street. The 1800s, with the seat of government moving to Westminster, were a period of decline relative to the industrial growth of Belfast. By 1900, the population of Belfast was nearly twice as large. Whereas Belfast was prosperous and industrial, Dublin had become a city of squalor and class division, built on the remains of lost grandeur. In 1913, Dublin experienced the the Lockout. James Larkin, a militant syndicalist trade unionist, founded the Irish Transport and General Worker's Union and attempted to win improvements in wages and conditions for unskilled and semi-skilled workers. Within a month, 25,000 workers were either on strike or locked out. The lockout lasted for six months, after which most workers, many of whose families were starving, resigned from the union and returned to work. Dublin was still the primary center of administration and transport for much of Ireland, though bypassed by the Industrial revolution. The Easter Rising of 1916 occurred in the city center, bringing much physical destruction. The Anglo-Irish War (1919 to 1921) and Irish Civil War (1922-1923) contributed even more destruction, leaving many of its finest buildings in ruins. From 1922, following the partition of Ireland, Dublin became the capital of the Irish Free State (1922–1949). Many buildings were rebuilt, and parliament moved to Leinster House. Through The Emergency during World War II (1939-1945), when Ireland was officially neutral, until the 1960s, Dublin's city center remained at an architectural standstill. This made the city ideal for historical film production, with many productions including The Blue Max (1966) and My Left Foot (1989) capturing the cityscape in this period. This became the foundation of later successes in cinematography and film-making. With increasing prosperity, modern architecture was introduced, while a vigorous campaign began to restore the Georgian greatness of Dublin's streets, rather than lose the grandeur forever. Since 1997, the landscape of Dublin has changed immensely, with enormous private and state development of housing, transport, and business. Some well-known Dublin street corners are still named for the pub or business which once occupied the site prior to closure or redevelopment. 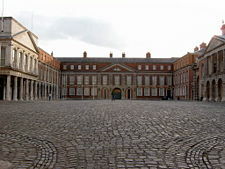 Leinster House, the eighteenth century ducal palace that houses the Dáil and Seanad. Ireland is a parliamentary democratic republic. The president, who is chief of state, is elected by popular vote for a seven-year term, and is eligible for a second term. The prime minister, (taoiseach) who is head of government, is nominated by the House of Representatives and appointed by the president. The bicameral parliament consists of the senate of 60 seats, with 49 members elected by the universities and from candidates put forward by five vocational panels, and 11 nominated by the prime minister, to serve five-year terms. The House of Representatives has 166 seats, the members of which are elected by popular vote on the basis of proportional representation to serve five-year terms. The City Council is a unicameral assembly of 52 members, elected every five years from Local Election Areas. The party with the majority of seats decides who sits on what committee, what policies are followed, and who becomes Lord Mayor. Chaired by the Lord Mayor, the Council passes an annual budget for spending on housing, traffic management, refuse, drainage, planning, etc. The Dublin City Manager is responsible for the implementation of decisions of the City Council. 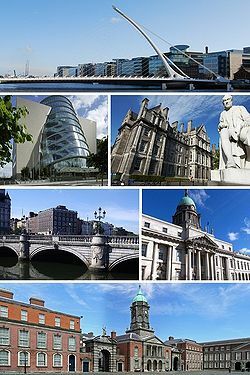 The City of Dublin is the area administered by Dublin City Council, but the term normally refers to the contiguous urban area which includes the adjacent local authority areas of Dun Laoghaire-Rathdown, Fingal and South Dublin. Together the four areas form the traditional County Dublin. This area is sometimes known as 'Urban Dublin' or the 'Dublin Metropolitan Area'. The Docklands of Dublin, east of the city centre. The southbound entrance of the Dublin Port Tunnel. A DART train, forming part of the Dublin Suburban Rail network. Ireland is a small, modern, trade-dependent economy. Agriculture, once the most important sector, is now dwarfed by industry and services. Although the exports sector, dominated by foreign multinationals, remains a key component of Ireland's economy, construction fueled economic growth around 2008, along with strong consumer spending and business investment. Dublin has been at the center of Ireland's phenomenal economic growth from 1993-2008, a period referred to as the Celtic Tiger years. In 2008, Dublin was listed as the fifth-richest city in the world . It has the second highest wages for a city in the world, ahead of both New York City and London, though behind Zürich. Dublin is one of the constituent cities in the Dublin-Belfast corridor region which has a population of just under 3 million. Per capita GDP for Ireland was estimated at $43,100 in 2007. Banking, finance and commerce are important in the city - the IFSC alone handles over €1-trillion a year. Numerous international firms, including Citibank, and Commerzbank, have established headquarters in the city. Also located there is the Irish Stock Exchange, Internet Neutral Exchange, and Irish Enterprise Exchange. The economic boom years led to a sharp increase in construction, which became a major employer, though, as of 2007, unemployment began to rise as housing market supply began to outstrip demand. Redevelopment is taking place in large projects such as Dublin Docklands, Spencer Dock, and others, transforming once run-down industrial areas in the city center. Brewing has been the industry most often associated with the city: Guinness has been brewed at the St. James' Gate Brewery since 1759. Since the advent of the Celtic Tiger years, however, a large number of global pharmaceutical, information and communications technology companies have located in Dublin and the Greater Dublin Area. For example, Microsoft, Google, Amazon, PayPal, Yahoo! and Pfizer (among others) now have European headquarters and/or operational bases in the city and its suburbs. Intel and Hewlett-Packard have large manufacturing plants in Leixlip, County Kildare, 15 km (9 mi) to the west. Dublin is also the main hub of the country's road network. 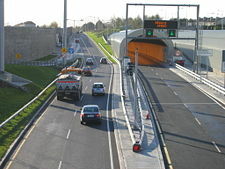 The M50 motorway, a semi-ring road, connects the most important national primary routes that fan out from the capital to the regions. Dublin is served by an extensive network of nearly 200 bus routes. 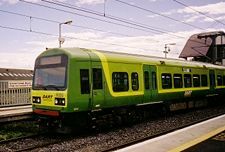 The Dublin Suburban Rail network has five rail lines serving commuters in the Greater Dublin Area, including an electrified line known as the Dublin Area Rapid Transit (DART) line that runs along Dublin Bay. A two-line light rail/tram network called the Luas opened in 2004. A subway was planned in 2005. Dublin Port is the country's busiest sea port and Dublin Airport is the busiest airport on the island. Dublin has a long history of emigration that continued into the early 1990s, since which time there has been net immigration. Foreign nationals are primarily young and single  and the greatest numbers come from the European Union, especially the United Kingdom, Poland and Lithuania, as well as a considerable number from China, Nigeria, Brazil, Australia, New Zealand and Russia. A total 87.4 percent of Ireland's population in 2006 was recorded as Irish, 7.5 percent were "other white," while 1.1 percent had a "black or black Irish" background, 1.1 percent were mixed, and 1.6 percent were unspecified. The official languages are Irish and English, although the latter is by far the predominant language spoken throughout the country. The Republic of Ireland is 86.8 percent Roman Catholic, and has one of the highest rates of regular and weekly church attendance in the Western World, although this has declined over the past 30 years. Immigration has increased Dublin's religious diversity, with increasing numbers of Protestants and Muslims. 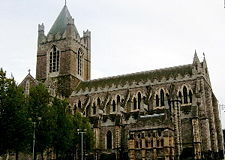 Dublin is the primary center of education in Ireland, with three universities and several other higher education institutions. The University of Dublin is the oldest university in Ireland. 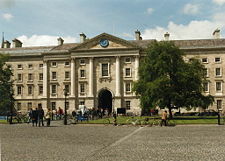 Its sole constituent college, Trinity College, was established by Royal Charter under Elizabeth I. 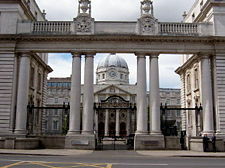 The National University of Ireland has its seat in Dublin, which is also the location of University College Dublin, the largest university in Ireland. Dublin City University (DCU) is the newest and specializes in business, engineering, and science courses. Croke Park, Europe's fifth-largest stadium and home to the Gaelic Athletic Association. Statue of James Joyce on North Earl Street, Dublin. Numerous literary figures from Dublin include William Butler Yeats, George Bernard Shaw and Samuel Beckett, Oscar Wilde, Jonathan Swift, and Dracula creator Bram Stoker. Others include J.M. Synge, Seán O'Casey, Brendan Behan, Maeve Binchy, and Roddy Doyle. The city is the location of the greatest works of James Joyce—Dubliners and Ulysses. The Book of Kells, a world-famous illuminated manuscript produced by Celtic Monks in 800 and an example of Insular art, which is on display in Trinity College. The Chester Beatty Library, which houses the famous collection of manuscripts, miniature paintings, prints, drawings, rare books and decorative arts assembled by American mining millionaire Sir Alfred Chester Beatty (1875-1968). Large art galleries include the Irish Museum of Modern Art, the National Gallery, the Hugh Lane Municipal Gallery, The City Arts Centre, The Douglas Hyde Gallery, The Project Arts Centre and The Royal Hibernian Academy. Three centers of the National Museum of Ireland are in Dublin, as are the National Print Museum of Ireland and National Library of Ireland. Theaters include the Gaiety, the Abbey, the Olympia Theatre, the Gate Theatre, and the Mahony Hall, which is the largest. The headquarters of nearly all of Ireland's sporting organizations are in Dublin, and the most popular sports in Dublin coincide with those that are most popular throughout Ireland: Gaelic football, soccer, rugby union and hurling. Croke Park is the 5th largest stadium in Europe. It hosts Gaelic football and hurling games during the summer months, as well as international rules football in alternating years, as well as concerts, with acts such as U2 and Robbie Williams. Inhabited since the Ice Age, Dublin has a rich history that includes foundation by the Vikings, English conquest and re-conquest, an 18th century golden era, decline and poverty, and re-emergence since the 1990s as an economic miracle. As capital of the nation with the second highest GDP per capita in the world, and the fourth highest Human Development Index, as well as high ratings for political, economic, and press freedom, as well as literacy, Dublin is well placed to continue as a prosperous city. With its rich literary history, and long history of emigration, the city is guaranteed a continuing stream of international guests, from literati, and from young travelers in search of their ancestral roots. ↑ Dublin City Council ',Dublin City Coat of Arms',. Dublincity.ie. Retrieved April 16, 2012. ↑ Thomas D'Arcy McGee. (1825-1868) A Popular History of Ireland Project Gutenberg. Retrieved September 20, 2008. ↑ City Mayors Economics. The world's richest cities by purchasing power in 2008 Retrieved September 20, 2008. ↑ City Mayors Economics. The world's richest cities by personal net earnings in 2008 Retrieved September 20, 2008. ↑ RTÉ News. April 2, 2007. Call for improved infrastructure for Dublin Retrieved September 20, 2008. ↑ Irish Times. July 12, 2007. Most new immigrants young and single Retrieved September 20, 2008. C.I.A. World Fact Book. 2008. Ireland Retrieved September 17, 2008. All links retrieved October 7, 2017. This page was last modified on 7 October 2017, at 16:16.